The Belcourt Theater has been showing Pan's Labyrinth, a fantasy tale by Mexican filmmaker Guillermo del Toro, and the run (unless extended) ends Thursday. The film has been widely praised (see press release below and local comments here via the Nashville Scene), and the Hispanic Nashville Notebook is offering readers two free tickets (see below). 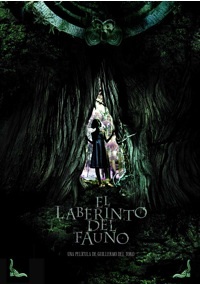 EL LABERINTO DEL FAUNO/PAN'S LABYRINTH (in Spanish with English subtitles), the new critically acclaimed film by Mexican filmmaker Guillermo del Toro is showing at the Belcourt Theater in Nashville. The movie was nominated for six Oscars - Achievement in Art Direction, Achievement in Cinematography, Best Foreign Language Film of the Year, Achievement in Makeup, Best Original Score, and Best Original Screenplay. Other nominations include Best Feature and Best Cinematography at the Independent Spirit Awards 2007, and Best Foreign Language Film 2006 Golden Globes. It won Best Film 2006 by the National Society of Film Critics and was featured at the Cannes Film Festival in 2006. Showtimes at the Belcourt are: Mon-Thu, Jan. 29th-Feb. 1st @ 5:00, 7:20, 9:40 Belcourt 615-383-9140. To be eligible to win two (2) free tickets, send an e-mail with "movie" in the subject to the editor along with your name, your preferred showtime, and at least one original photo of Hispanic Nashville (people, places, events, etc.) plus a description of the photo and where it was taken. Entrants must own the copyright to the photos they submit. Upon submission the photos become property of the Hispanic Nashville Notebook and may be published anywhere, including in the Hispanic Nashville Scrapbook. The winner will be chosen at the sole discretion of the editor. Tickets will be made available for pickup in the Nashville area during business hours.